A fantastically different plant, with green and cream star-shaped flowers with purple edges. Flowers resemble pineapples and appear in July to August/September. Flowers sit on a rosette of wavy edged fleshy leaves and make a good cut flower. Plants grow to a height of about 40-60cm. 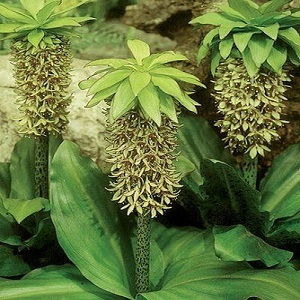 Pineapple Lilies prefer full sun and will tolerate part shade. They are on the edge of hardiness, so plant in a sheltered sunny position in well-drained soil and mulch the crown overwinter. In colder gardens, lift the bulbs in the autumn and replant in pots which can be kept in a greenhouse overwinter. 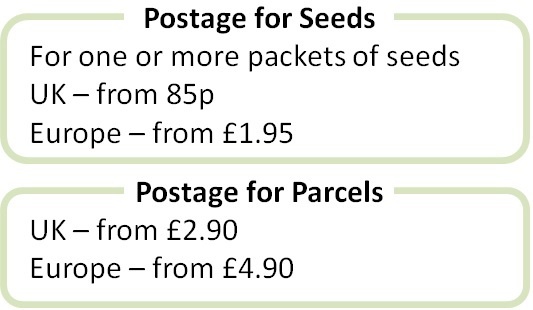 Sow in spring or autumn into a deep (eg 10cm) seed tray or pots of well drained seed compost. Seeds germinate within 4 -6 weeks (or longer, don’t give up) at 16°C to 20°C. Plant out when the bulbs have formed – generally in the third year, when the first flowers start to form. Grow Plants die down in autumn, when the dead material can be removed and the plants protected with mulch or removed and stored in a cool dry place. Plants start growing again in mid to late spring. Top dress with fertilizer in spring. Plants are generally untroubled by pests and diseases, except some nibbling from slugs and snails.. Mature plants produce off-sets on the bulbs, which can be removed in spring and grown on into new plants.